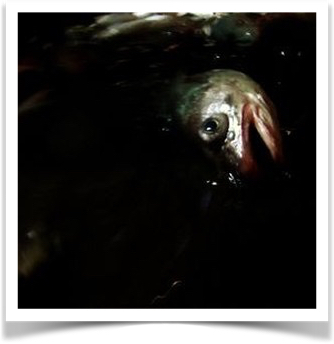 The viewer of Leviathan (2012) is plunged into pitch black, freezing cold waters and re-emerges, trapped in a net with several hundred fish before being dumped onto the deck of a commercial fishing boat. Later, having been washed, gutted and discarded by a rugged and weather-worn fisherman, they slosh around the deck of the boat accompanied by several hundred fish heads, once anguished eyes now given way to emptiness. Made by two members of the Sensory Ethnography Lab (SEL) at Harvard, Leviathan extends a long lineage of films that undertake an immersive ethnographic study of people and cultures, standing alongside Sweetgrass (2009), a poetic ode to the dying tradition of sheep herding, and Manakamana (2014), a journey to and from a Nepalese Hindu temple in a cable car. The SEL’s filmmakers attempt to create not simply a visual but also a sensory experience. As with the fish in Leviathan, the films are an act of embodiment, via the human and the nonhuman, designed to heighten the viewer’s senses through associative remembering. As Ernst Karel, manager of the SEL and sound mixer/editor on Sweetgrass, Leviathan and Manakamana, states, “[This approach] takes advantage of the fact that our cognitive awareness – conscious as well as unconscious – consists of multiple strands of signification, woven of shifting fragments of imagery, sensation and malleable memory” (qtd. in Wright). In his “Kino-eye” manifesto Soviet filmmaker, Dziga Vertov, expressed his belief that his camera was an extension of his body’s visual capacity, writing “I am eye. I am a mechanical eye […] My road is towards the creation of a fresh perception of the world. Thus I decipher in a new way the world unknown to you” (qtd. in Sobchack 184). If the SEL were to update this declaration it might read, “We are body,” or appropriate to Leviathan, “We are fish head.” The auteur-centric “I” giving way to a collective “We” as the audience are one with the filmmakers and their subjects in this act of immersion and discovery, an act made possible through their own previous sensory experience and through their interpretative gaze. In this sense, the audience transcends the term viewer and becomes an active participant. Sensory ethnography films, and the technology they use, have the distinct capacity to transport the participant to previously impossible places. Geographer Yi-Fu Tuan asserts, “An object or place achieves concrete reality when our experience of it is total, that is, through all the senses as well as with the active and reflective mind” (18). Sensory ethnography films attempt to create such a ‘concrete reality’ for the audience, enabling an experience of many senses. A review of Leviathan suggests the film offered viewers a “so-close-you-can-touch/taste/hear/smell-it vision of life” (Jenkins). The filmmaker’s intention, too, is to allow space for viewers to mindfully seek discovery within what they are experiencing and, therefore, within themselves. Spencer Shaw, in Film Consciousness, elaborates on the concept of phenomenological, or transcendental, subjectivity, which describes an audience’s conscious “supra-human” experience and perspective through the structure of film and, subsequently, audience participation (5). This concept is perhaps most prevalent in Manakamana where the camera, and therefore the viewer, sits opposite various pilgrims travelling to the Manakamana temple. Our immediate experience is at one with theirs. We are travelling in the same cable car, seeing similar sights, hearing the same sounds, feeling the creak and sway of the car as it journeys up and down. Our secondary experience becomes transcendental. The camera is directed at the faces of the travellers, faces that we witness for the duration of a single ride (and one shot, roughly the length of a roll of 16mm film) but that encapsulate a lifetime. The viewer is invited to ruminate on the lives of these people, to create stories from their smiles, or memories from deep within their eyes. In this we transcend the visual and the physical, and enter an imaginary state composed of all the senses. Ethnographic filmmaker and scholar, David MacDougall, states, “In making films […] we use “found” materials from this world. We fashion them into webs of significance, but within these webs are caught glimpses of being more unexpected and powerful than anything we could create” (4). From the space left by the camera’s gaze, Manakamana invites the audience to experience a world and culture through sensations, forming a being of greater meaning through subjective transcendentalism. Every audience member inhabits the Kino-body riding on the cable car, but simultaneously, every audience member is invited to see through their eyes, hear through their ears and create through their minds. While sensory ethnography films often rely on subjective participation to make whole the film’s experience, there are distinct moments of auteur intention. After every ascent in Manakamana, the film pauses in blackness for a few minutes. Pacho Velez, one of the film’s directors, says “It’s a moment for the film’s characters to have an experience with the goddess” (qtd. in MacDonald). With the emphasis still firmly on experience, the elongated blackness disables sight for a moment in order to heighten other senses, especially hearing, as the sounds of the temple are here seemingly within touching distance. It is also a time in which we, as the audience, are offered a moment to have an experience with ourselves, to pause and reflect. It could possibly be seen as a statement by the film’s directors Velez and Castaing-Taylor that film, or more specifically ethnographic film, is becoming less visual-centric and progressively more about the experience of the other senses. Leviathan – perhaps the most illustrative in terms of auteur intention – often, like Manakamana, plunges the audience into darkness in the scenes when the camera swims with the fish. This ultra-sensory film forms many associations between different senses. In one moment we are attached to the exterior of the boat, witnessing endless chum pour out from the side of the deck. The filmmakers position the audience so close to the blood and guts of the fish that we have no choice but to physically smell this sight through synaesthesia – the involuntary experience of a secondary sense through the stimulation of another – as well as through the recall of our own subjective experience of bad smells. Later in the film we are positioned next to a television in the interior of the boat. The television plays The Deadliest Catch (2005-ongoing), a documentary television series chronicling the perils of commercial crabbing. We see a fisherman wearily gazing up at the television and at us, a cigarette hanging loosely from his teeth. The shot plays out for several minutes as the fisherman slowly falls asleep, exhausted. Whilst also being somewhat self-referential – the filmmakers are also perhaps bringing up the question of whether theirs is a documentary, or whether it is something different entirely – Velez and Castaing-Taylor are making us sympathise, but also empathise, with this man. For, as he has endured a punishing, physically gruelling experience and an attack of the senses, as have we. Their official website declares that the SEL “promotes innovative combinations of aesthetics and ethnography. It uses analog and digital media to explore the aesthetics and ontology of the natural and unnatural world” (sel.fas.harvard.edu). Whilst exploring numerous sensory possibilities, the lab often foregrounds the visual, pushing the boundaries of film syntax through extreme long takes, esoteric camera angles and illustrative framing. Echoing Tuan, Megan Ratner states that the extended takes of Sweetgrass “allow the viewer to absorb the scene in its totality, with people characterized by their actions rather than their speech.” The impossibility of experience is brought to life when the embodiment takes place via an animal, Sweetgrass’s cinematography evoking “the experiences of the sheep, of what it was like to inhabit their bodies, rather than to stare at them as objective bodies/ animals” (Ratner). Here we are asked to embark on a deeply imaginative process. Indeed, at certain moments in Sweetgrass it is as if we are being swept along by the swell and force of the hundreds of sheep. We are amongst them, at the mercy of the herders. As for the lab’s meticulous framing of shots, MacDougall writes “by isolating observations, it reveals commonalities and connections that have gone unnoticed before […]. It is what lifts something out of its background in order to look at more closely, as we might pick up a leaf in the forest” (4). The SEL’s use of analog and digital technology is indicative. 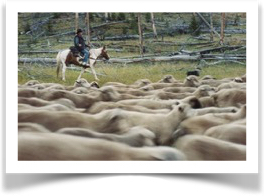 Sweetgrass is essentially a film about the one final journey over the Beartooth Mountains of Montana for sheep herders whose traditions have become outmoded. Shot on 35mm film, itself facing obsolescence in the face of digital technology, the film traces the way the world must adapt to human and technological change, and vice versa. Manakamana was shot on 16mm film largely for how the length of one reel amounted to the duration of one journey of the cable car. The film also displays a merging of pioneering and traditional technology. One of the cable car travellers recounts a past time in which they would trek up the mountain to the temple of Manakamana. While the technology of the cable car has forced an evolution in the traveller’s spiritual journey, the 16mm film restores a sense of tradition by allowing their stories to unfold in the face of this evolution. Like a palimpsest, the past and present are layered into a single filmic moment. Conversely, Leviathan embraces digital technology. David Jenkins suggests that because the film was shot entirely on GoPro cameras, “the timeworn logistics of the filmmaking process have been altered: subjects no-longer have the stigma of a “camera” to contend with, there is no ’action’ and no ’cut’, and they’re able to go about their business without feeling like they need to create a cinematic character.” Indeed, this method seems to encapsulate Vertov’s “life caught unawares” credo, simultaneously enhancing the SEL’s ideology of embodiment, more intimately and extremely than before (Dawson). GoPros are sold, says Cahill, “as fostering an extreme cinema realized through a cinema of extremities, wherein the human user and device mutually extend into each other, so it is not always clear who or what is agent and appendage; they are like crittercams for humans” (273). While the emphasis on the human is too narrow, as Leviathan clearly shows, Cahill usefully outlines the expansive possibilities of sensory and bodily immersion through technology. A perpetually evolving technology is perhaps the future to the most important question that sensory ethnography films seek to pose and answer. Where do human beings stand in the world? What is our past and what is our future? What is our responsibility? Sensory ethnography film often “extrapolates “sensory” from the human body to the body of the world itself – to the bodies of matter, nature, economic exploitation” (Leimbacher). In this sense, we become one with the world, sharing collective senses, growing a sudden and strong affinity with human and animal alike, and developing empathy towards formerly distant entities such as the shifting landscape and the exploited earth. Beyond, or perhaps influenced by, the sensory ethnography film, technologies continue to advance with the purpose of connecting humans with the natural world, whilst simultaneously allowing the participant to embark on an experience of the senses and an exploration of the imaginary. In 2015, naturalist Sir David Attenborough partnered with the Natural History Museum in London to create an immersive virtual reality experience to explore human-caused environmental damage to the Great Barrier Reef. In the same year and from the same collaborators, came First Life, another virtual reality experience that allowed participants to explore “ancient oceans and interact with sea creatures that existed more than 500 million years ago,” taking them to formerly “impossible places” (nhm.ac.uk). This cooperation between the ideology and practices of the sensory ethnography film and advanced technology such as Go-Pro cameras and virtual reality highlights the growing ethical and moral reach of this field of study. By taking us to a “concrete reality”, even if that reality existed millions of years ago or is lodged in a memory, sensory ethnography makes the filmmaker/audience/participant look closer at the evolving, transcendental, fragile nature of the world; just like picking the leaf up in the forest. Cahill, James Leo. “A Youtube Bestiary: Twenty-six theses on a post-cinema of animal attractions.” New Silent Cinema. Ed. Groo, Katherine; Flaig, Paul. Routledge. New York. 2016. Dawson, Jonathan. “Dziga Vertov.” Senses of Cinema. n.d. Web. Mar. 2003. Jenkins, David. “Leviathan.” Little White Lies. n.d. Web. 29 Nov. 2013. Leimbacher, Irina. “The World Made Flesh.” Film Comment. Mar. 2014. Web. 16 Apr. 2014. MacDonald, Scott. “Interview: Stephanie Spray & Pacho Velez.” Film Comment. n.d. Web. 11 Apr. 2014. MacDougall, David. The Corporeal Image: Film, Ethnography and the Senses. Princeton University Press. 2006. Pink, Sarah. Doing Sensory Ethnography. Sage Publishing. 2009. Ratner, Megan. “Once Grazing, Now Gone.” Film Quarterly. Vol. 63, No. 3. Spring 2010. Sobchack, Vivian. The Address of the Eye: A Phenomenology of Film Experience. Princeton University Press. 1992. Shaw, Spencer. Film Consciousness: From Phenomenology to Deleuze. McFarland & Company Inc. Publishers. Jefferson, NC. 2008. Tuan, Yi-Fu. Space and Place: The Perspective of Experience. E. Arnold. 1977. Written by Joseph Gilson (2017); Queen Mary, University of London.